“A key driver in the office sector is a continuing change in workplace culture with more intensive occupation of space and greater demand for smaller offices, while in the industrial and logistics market there remains a shortage of stock, exacerbated by the painfully slow and politicised planning process,” he says. SHW’s research for 2018 shows that Brighton’s office market continues to play a starring role. McAleer & Rushe’s 63,000 sq ft Brinell building in the city centre is fully pre-let ahead of practical completion this June, setting a new rental high of £32/sq ft. The spotlight is now on U&I’s mixed-use Circus Street development and First Base’s 120,000 sq ft office scheme on the former American Express site. With availability in Brighton below 3.5%, SHW believes pent-up demand will soak up this new space and rents will keep rising. Hardwicke adds that office occupiers’ profile is changing, particularly in Crawley, where most lettings now fall between 5,000 sq ft and 10,000 sq ft.
As a result, take-up in the town last year was 93,000 sq ft, which is lower than the five-year average, while availability rose to 678,000 sq ft, accounting for 17% of total built stock. “There are some good opportunities for occupiers seeking larger buildings not available in other South East locations,” says Hardwicke. In contrast, Crawley’s industrial and logistics market recorded its lowest availability for at least five years, at 247,500 sq ft or 2.4% of total built stock. Take-up was steady at 229,500 sq ft and Hardwicke says it would have been far higher if more stock had been available. 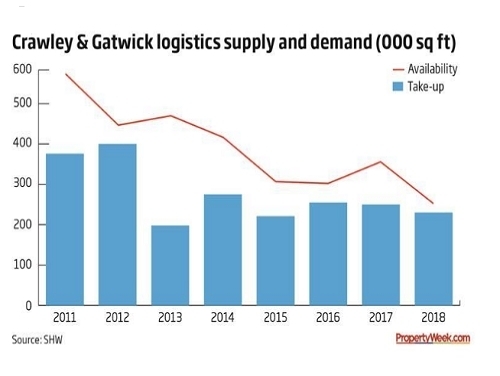 Fortunately, 300,000 sq ft is being speculatively developed in the next 12 to 18 months, at the likes of Goya’s Gatwick 33 and North Gatwick Gateway. It is a similar story in Horsham. Industrial and logistics take-up could have been three times higher than the 37,000 sq ft achieved last year if more stock had been available. Unsatisfied requirements total more than 425,000 sq ft.
Like many South East locations, if land is not released for development soon, occupiers will be forced to relocate elsewhere, possibly even as far afield as the Midlands or further north if they are “footloose”, Hardwicke says. First published in Property Week 8th February.